(Nanowerk News) Although only about 400 kilometres separate the Kontur-2 joystick and the German Aerospace Center (Deutsches Zentrum für Luft- und Raumfahrt; DLR) ROKVISS robot, the remote control operations that took place on 18 August 2015 were truly special: Cosmonaut Oleg Kononenko, flying aboard the International Space Station (ISS) over Earth at 28,000 kilometres per hour, controlled the robot on the ground while in microgravity. 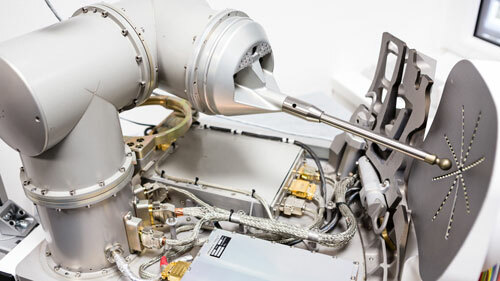 The connection between space and Earth is not one-directional – the ROKVISS (Robotic Components Verification on the ISS) sends data back to the joystick when contact forces occur on the ground. At 16:37 CEST (ISS orbit 3775), the metal fingers of the robot moved for the first time – controlled remotely from space. “At that moment, Kononenko not only saw what was happening using a camera, but, through the joystick, felt exactly what was happening with the robot in our laboratory,” says Jordi Artigas from the DLR Institute of Robotics and Mechatronics. In autumn 2015 the first ‘tele-handshake’ will be performed between the ISS and Earth with this technology, when the DLR Robot ‘Space Justin’ remotely shakes hands with someone on Earth from space – with force feedback. 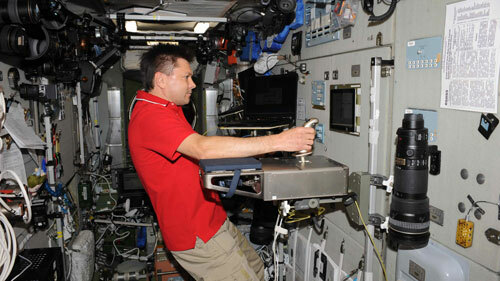 Cosmonaut Oleg Kononenko with the Kontur-2 joystick. For the future of space exploration, this telepresence technology means that a cosmonaut could operate a robotic assistant from a space station while it performs tasks requiring fine motor skills on the surface of Mars, for example. The astronauts would have force feedback that would enable them to feel as though they are working locally. The task on 18 August was much easier. ISS Commander Kononenko moved the metal fingers of ROKVISS in all directions and gently touched a contoured surface while Artigas gave him appropriate instructions from the ground. Special sensors measure the contact forces when the robot comes into contact with an obstacle; this collision data is sent to actuators in the joystick, which then provides feedback to the operator. In total, just four minutes were available to test the remote control between the ISS and DLR. Unexpectedly, at the beginning of the overflight, a component of the Space Station may have obscured the antenna and the direct radio connection was slow to become established. At 16:42, the ISS, the cosmonaut and the joystick disappeared over the horizon and as a result left the reach of the coverage area of the DLR antenna in Weilheim. Before this, control commands and force feedback data had been transferred between the Russian segment of the ISS and the robot via the German Space Operations Center (GSOC) at DLR. The transmission of data incurs an average time delay of 30 milliseconds. “Human reaction time is about 100 milliseconds and causes no problems for the cosmonauts, but for robotic control 30 milliseconds is already a huge challenge, since the closed loop between Earth and the ISS may become unstable,” explains Artigas. The loss of data packets during transmission complicates smooth cooperation between cosmonaut and robot. This is where the ‘Time Domain Passivity Control’ method developed by DLR for telepresence systems allows for stable and high-performance operation under all possible communications conditions, including delays of up to approximately one second. On 21 August 2015, the experiments, during which the cosmonaut will perform a number of tasks with the robot, will be continued during two ISS overflights. Kononenko will again control the metal fingers of ROKVISS and follow contours on the experimental setup. Again, the visibility of the ISS will determine how much time is available for the experiments. “We will have seven to eight minutes of contact with the Space Station,” explains DLR researcher Bernhard Weber. The DLR Institute of Robotics and Mechatronics has been researching the field of telerobotics since the 1990s. Also in space, humans and robots need to work together as a team. For a time, DLR researchers controlled the ROTEX robot inside the space shuttle from the ground; sometimes they used the flight model of the ROKVISS robot on the outside of the ISS. Now, for the first time, a robot with multiple degrees of freedom was controlled from the ISS with force feedback. “With Kontur-2, we have achieved the next milestone; cosmonauts now use our technology to work with robots on the ground,” says Alin Albu-Schäffer, Head of the Institute. In future, this could happen not on Earth, but on Mars or the Moon to build habitats, for example – while the robots are remotely controlled from a space station in orbit.